How old is the James G. Martin Center? The Martin Center began as the Pope Center began in the mid-1990s. At the time, it was a small project of the John Locke Foundation. The Pope Center grew and became an independent organization in 2003. The Pope Center changed its name to the James G. Martin Center in January 2017. Why did the Pope Center change its name? Many people—both in North Carolina and around the nation—confused the Pope Center with the Pope Foundation. Although both organizations were named after John William Pope, their missions are different. By changing our name, we can help ensure that our identity is distinct from that of the Foundation. 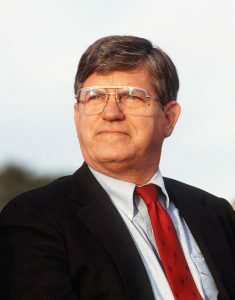 James G. Martin, governor of North Carolina, in 1988. Why is the Center now named for Governor Martin? Governor Martin has a long legacy of both academic work and public service. Martin began his career as an educator, earning a Ph.D. in chemistry from Princeton University and later teaching chemistry at his alma mater, Davidson College. He served the public as a county commissioner, a Representative to the U.S. Congress, and governor of North Carolina. Did the Martin Center’s mission change along with its name? No, our mission will remain the same. We will continue to promote excellence in higher education through changes in public policy, better public information, and encouraging best practices. For more information about the mission and background of the Martin Center, please read Our History.